Geez you really want an Oscar menu? You’re having an Oscar party to see how Chris Rock handles the tone deaf lack of Oscar diversity? Well that’s the only reason I plan to watch too, so I can relate. I am not providing a full Oscar menu but here’s a suggestion: eat whatever you want as long as it’s diverse – since, you know – diversity is GOOD FOR US as a society and as individuals. We can’t survive on hummus alone. Mix it up and you’ll have a much healthier, richer and more interesting experience. Oh and start with a bubbly champagne cocktail. We had a great dinner with my husband’s mother and her boyfriend a couple of weeks ago. It was cold as bones outside and right before Valentine’s Day. This is a lovely meal for four that can easily be expanded for a larger party. Start with a simple hors d’oeuvre – maybe a bowl of marcona or smoked almonds and a cocktail. Nothing heavy. Nobody makes meatloaf anymore, so we made meatloaf and it was delicious. 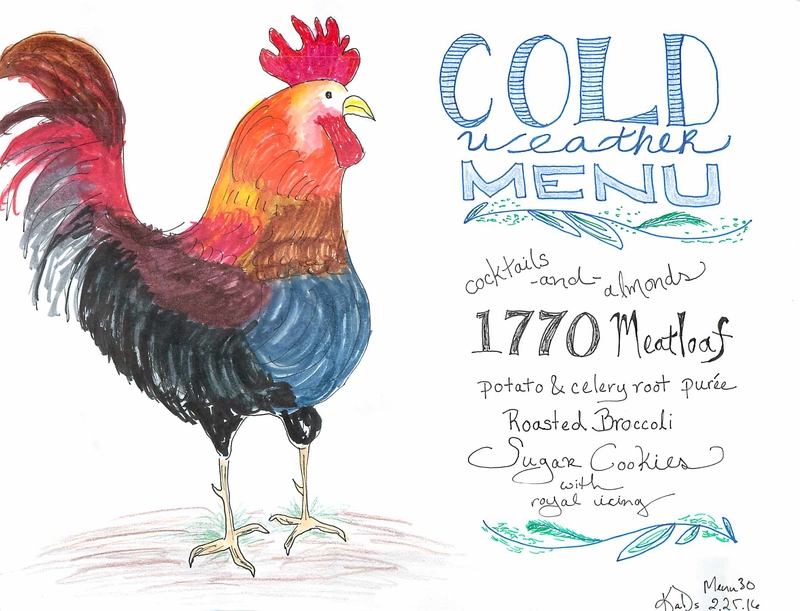 Ina has a great recipe from a place in the Hamptons – The 1770 House. It calls for beef, pork and veal. None of my local stores were selling veal so I left it at beef and pork and were none the worse for wear. It calls for a garlic sauce. This part needs work. It was somehow tasteless and took some gussying (a bouillon cube; more butter; a dash of Worcestershire). I would make that part again but next time I might start with a roux and homemade beef stock. We’re going homey here – let’s make a blinged up Potato Celery Root Puree (when I think BLING I think CELERY ROOT). Ina Garten buried a ridiculously good potato/celery root puree within a scallop recipe – I’ve linked to it for you below. I followed it almost exactly (I added a little milk to the cream to just cover the vegetables). This can be made earlier and reheated. And then we roasted broccoli. It’s really the best way to eat it. Just before serving grate some lemon zest on top and well, it’s just like mom used to make but better. We weren’t skimping on dessert. 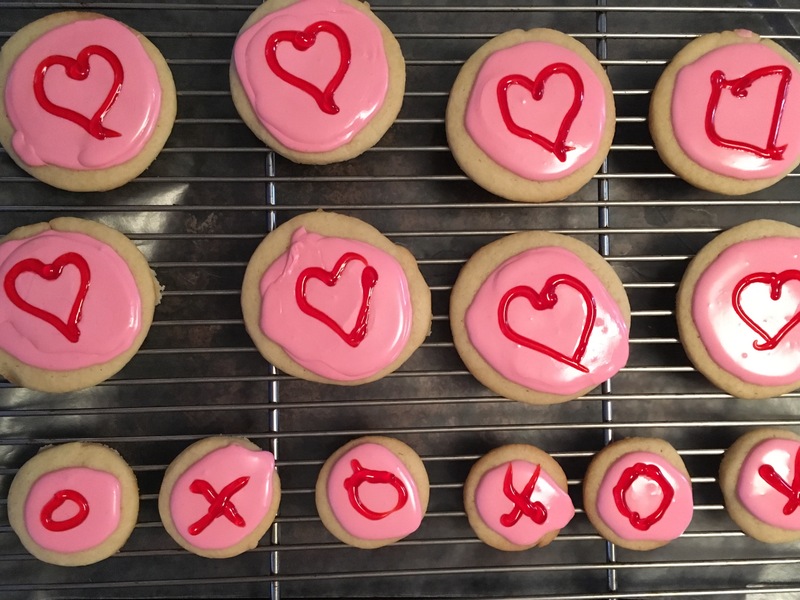 I had a disc of holiday sugar cookie dough left in my freezer so made round sugar cookies, topped with royal icing (pink) and then decorated with hearts (red). They were delicious and GONE. I think you should do the exact same thing but decorate however you want. Serving homemade cookies never gets old. P.S. Why the rooster? My mother-in-law has a thing for birds like this so I thought I would draw one. 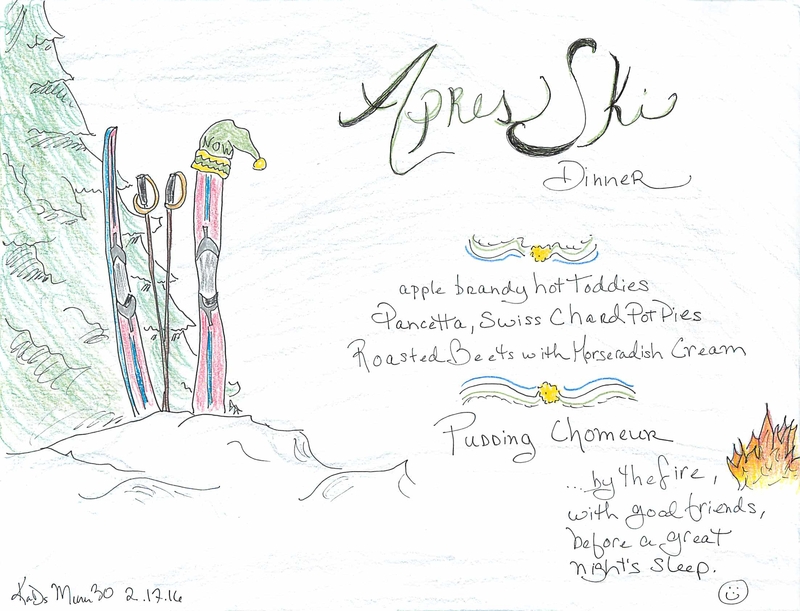 Menu 30 – Apres Ski! This menu is actually good après most cold weather activities…skiing, skating, shoveling. It’s make ahead, humble and filling. We’ve even got a nod to Quebec in here this week with a very rich, very simple dessert. Forget après…how about “anytime” is more like it. When everyone is back and throwing their wet snow pants around, get the hot toddies going. We drink these all year round and definitely when we feel like we’re getting a cold. Best elixir ever. You can make the pot pie filling in advance and cut out your dough. If you get lazy (I might), substitute puff pastry which you can easily buy in the freezer section. Puff pastry makes everything better and always looks pretty. Beets. You know, I keep trying to like them. My family razzes me about this (“how can you not like beets!”) but these have a shot. Horseradish cream got me going. This dessert can be made in ramekins or in one larger pan. I would definitely opt to serve with cold heavy cream poured over. If that’s not your thing we can’t be friends. 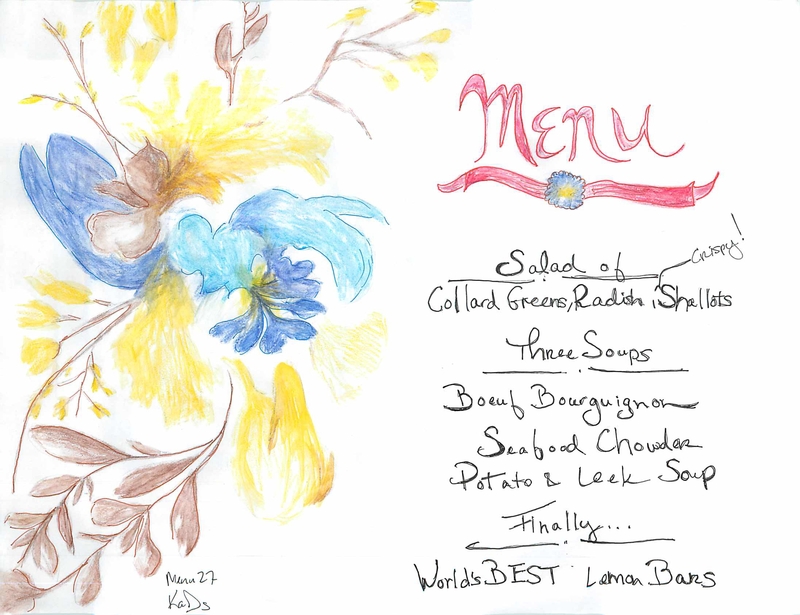 Menu 27 – Ladies’ Night! It takes forever to find a date. Babysitting/husband/partner/work/travel schedules have to align. But when that night arrives, you cherish it. You know what I mean, that evening when it’s just you and your girlfriends. The talk swings from houses to hair to new business ventures to books to how to form an LLC to the best kids’ apps to wine to how to tell your assistant her skirt is too short and on and on. Make it happen. And make it happen over dinner, at someone’s house. Restaurants are great but at someone’s house you can sit on the floor with friends and laugh and get to the table and grab a bowl of soup and then head back to the floor for dessert. But we all know that everyone doesn’t eat everything. Now things get hard. What to cook? The answer is soup – THREE soups to be exact…one meat, one seafood, one veg. Offer a Boeuf Bourguignon Soup (made in advance) and a side of noodles; Ina’s Seafood Chowder (made day of); and last, make Potato Leek soup (in advance) for a vegetarian option. Voilà! Problem solved. That should cover just about anything people throw your way in terms of restrictions. Also, people always ask what to bring. Get someone to bring a salad – a great winter salad of under-appreciated collard greens and life changing crispy shallots. Ask another to bring dessert (which MUST MUST MUST be these amazing lemon bars!). Stocking up on wine goes without saying. Now go send an email to those friends and pick a date. You won’t regret it.